My copy arrived yesterday and I’m already getting some great ideas for my layout. “19 East, Copy Three” explains how to use Time Table and Train Order operations on a model railroad. The book starts with a reprint of a series that David Sprau wrote about TT&TO operations for the SIG’s quarterly magazine. 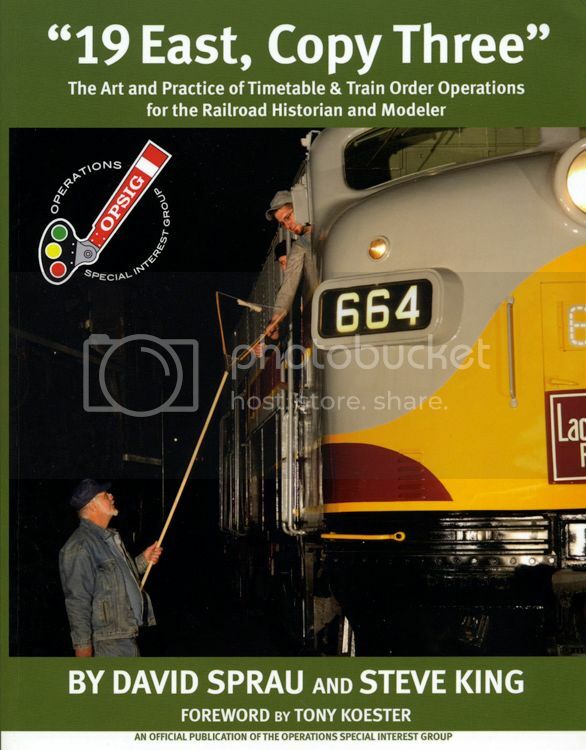 David is a professional railroader – a retired dispatcher who walks readers through how TT&TO operation works. I remember the original series – it’s a great read. In the second part of the book, co-author Steve King – another one-time railroader whose duties included turns at the dipatcher’s desk – translates TT&TO operation to the model railway environment. This is the magic that’s really needed for many people – an understanding of how to design a layout for TT&TO operation, especially given that so many hobbyists (myself included) are not professional railroaders who do this every day. Do I need Time Table and Train Order operation on my modest layout? From a practical perspective, of course not. I run a single train on the line at a time. That said, the prototype was governed by TT&TO – even though the entire branch was considered part of yard limits from the first switch south of Simcoe to end of track in Port Rowan. So to make my paperwork complete, I should issue a crew with a condensed employee time table, a clearance form, and any relevant orders in addition to freight waybills. It’s all about creating – or, re-creating – a slice of a real railroad and that includes the paperwork. Since we’re unlikely to kill anybody if orders aren’t understood and obeyed, I’m not going to be a dragon about any of this. So visitors don’t have to worry – if they just want to turn on the power and switch a few cars, I’m cool with that. But I want to better understand what it was like to work this branch – and understanding the environment in which crews performed their duties is an essential piece of that puzzle. I’ve read a couple of chapters, and that’s enough to highly recommend this book to anybody interested in building their knowledge of TT&TO. Well done, David, Steve, the editors, and the many contributors who helped bring this book to print! This entry was posted in Beyond Port Rowan in S, operations, resources by Trevor. Bookmark the permalink. It is a great book and nice to have both series between one set of covers. This book should be a good read. One of the struggles I deal with (as an armchair railroader at the moment) is the disparity between a realistic mode of operation, such as you have here with switch stands, mock air hoses, etc., which I prefer, and a time table driven operation. The latter typically prompts one to use a fast clock which, in my opinion, leads the yard switcher to fly through his/her duties to feed the schedule. The converse is to force a scheduled freight team to sit for sometime under a normal clock while we switch at a “safe” speed. Most of the TT&TO layouts I have operated on use a 3:1 ratio for the fast clock. Enough to enhance the passage of time but not enough to cause great stress.